Economics 101 will be offered Tuesdays and Thursdays at Mojave High School from 5:30 to 6:55 pm. The semester begins August 24th and ends December 12th. Concurrent Enrollment at Cerro Coso is free for most high school students, regardless of high school; and even the books are free for students of Mojave Unified from Mojave or Cal City. Classes are only $140 for non-high school students. 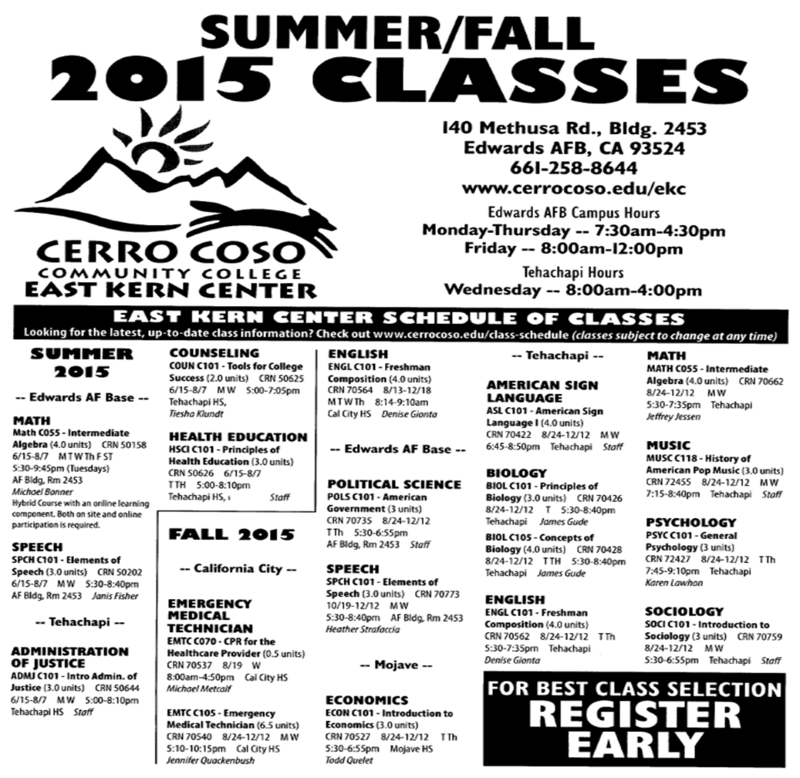 Call Kristin Hanle at 661-258-8644 for questions (M-Th 7:30-5:30; F 8-12), or visit the Cerro Coso website at www.cerrocoso.edu. This entry was posted in Cerro Coso, Mojave CA, Mojave Unified School District and tagged Cerro Coso, Economics, Mojave on April 24, 2015 by mojavefoundation. August 14: Mojave Unified School District (MUSD) struck a partnership with Cerro Coso Community College (CCCC) to bring college course to Mojave and Cal City. CCCC will be offering Biology at Mojave High School on Mondays and Wednesdays from 5:30 to 8:40 pm. The course will be four credits, and run from August 23rd to December 13th. CCCC is also offering course at Cal City high school such as CPR training on August 20th for half a credit, and 6.5 credits of Emergency Medical Technician (EMT) training Mondays and Wednesday from 5:10 to 10:15 pm. This fall, students at Cal City high school will also have access to four credits of college English, offered Monday through Friday from 8:14 to 9:10 am, taught by Denise Gionta. CCCC course will also be available at Edwards Air Force Base, such as Political Science, Intermediate Algebra and Speech classes. We applaud MUSD’s efforts to partner with CCCC and encourage MUSD to expand their offering of collegiate courses in both Mojave and Cal City. This entry was posted in Cerro Coso, Mojave CA, Mojave Unified School District, School on August 14, 2014 by mojavefoundation.